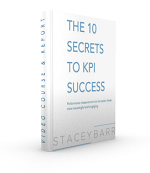 Do Your Colleagues Have the Wrong Idea About KPIs and Measurement? Possibly at the root of all objections people have to measuring performance and having KPIs is their beliefs about why we do it. Before you can successfully overcome all the other typical objections people have – like not having the time, not knowing where to start, not seeing the need for it – you need to be sure first and foremost that people understand the real reasons why we measure performance. Think about all the dysfunctional behaviours you’ve seen or heard people doing, in relationship to performance measures or KPIs: changing the way customer satisfaction is calculated to increase the percentage who were “satisfied”, leaving out excessively late or lost deliveries when recording on-time delivery data, arming themselves with every excuse under the sun about why revenue is under target. It’s not because people are bad that they do these things. It’s because they have the wrong beliefs about performance measurement. They believe that KPIs or performance measures exist to judge them. They believe that performance measures are for reporting upward to management or external stakeholders. They believe that they have little to no control over the measures they are judged by. These beliefs are held by frontline workers, middle managers, senior executives and even boards of directors. So before you try and solve the problems of people not having the time to measure, not having the know-how to measure, not seeing the value in measuring, you first have to start different conversations about what performance measures are truly for. Performance measures and KPIs are not to judge people, but to inform them. Performance measures and KPIs are not for reporting upward and outward, but for reporting within the team. Performance measures and KPIs are not for the results that people control, but for the results that they can influence. Performance measures and KPIs are feedback to inform and empower and inspire people to do their best. That’s a message worth spreading. 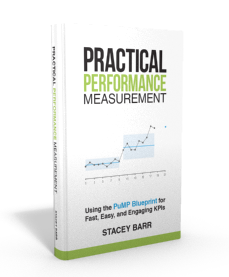 Start new conversations about performance measurement in your organisation or company. Create your own “elevator speech” – a 60 second engaging and informative summary – for what performance measurement is really all about, in your own natural words. Challenge yourself to share it with at least 5 people each day, in natural conversation. Test and tune it until you get the response you want from them (which could be to ask you a question to get more information). For the first time after 5 years of working as a M&E Officer in a provincial administration of a developing country in the pacific, I come to fully understand the reasons why our KPIs are not being effectively measured. One for the obvious reasons is colleagues are not aware of the importance of KPIs and their negative perception of it. Also, it tend to show people who are afraid of KPIs are the ones who do not effectively perform their jobs. Cheers and I see you as a real expert on performance measure and would recommend you to my senior managers should there be an opportunity in the future.